A family of eight who died after their car plunged off a California cliff were killed in a "murder-suicide", the state's coroner's office has ruled. Sheriff-Coroner Thomas Allman explained that a 14-panel jury had ruled unanimously that the two women - Sarah and Jennifer Hart - deliberately drove off a 100ft (30m) cliff with their children in tow. Sarah Hart, and several of the children, were found to have Benadryl - an allergy drug that causes drowsiness - in their bodies at the time of the crash. "They both decided that this was going to be the end," he said at a coroner's inquest. "That if they can't have their kids that nobody was going to have those kids." Investigators had suspected the act had been deliberate, based on the car's computer and the lack of braking skidmarks in the road, which would have indicated an accident. 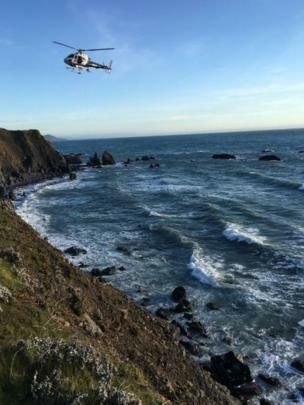 The bodies of five of the children - Markis, 19; Hannah, 16; Jeremiah, 14; Abigail, 14; and Ciera, 12 - were found within or nearby to the vehicle, which landed upside down on a Pacific Ocean beach. Investigators found the that the couple had been accused of child abuse several times, and that days before the crash officials in Washington state had opened an investigation after Devonte rang a neighbours' doorbell and said his parents were withholding food.